Look for colours and styles you like before looking at labels. Buying just for a label in a charity shop is a recipe for a wardrobe full of unworn clothing & footwear. Equally, don't buy a well worn/bobbled/faded item just because of the label. Worn out clothes will never look good on you. Only ever buy items that fit you well...sounds obvious but I've witnessed so many people buy things that are too big or small. 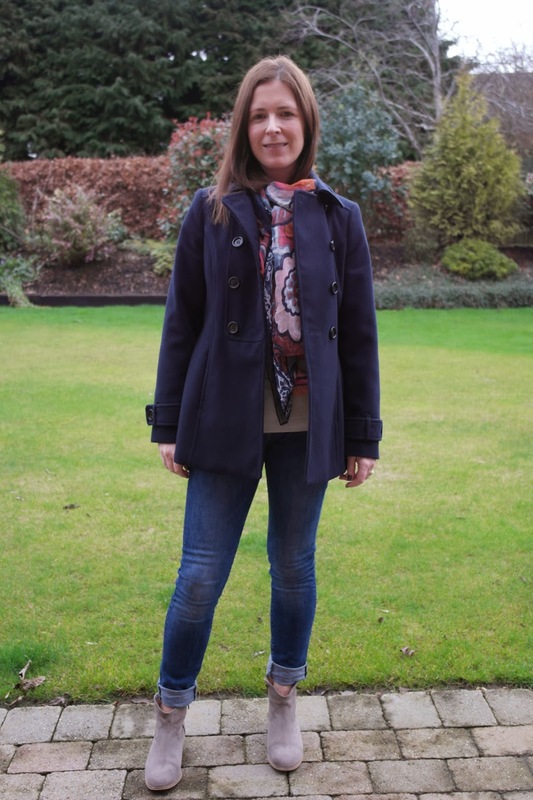 The best rails to head for first in a charity shop are jeans, jackets/coats and dresses, (esp. occasion wear). Most knitwear, tops, t-shirts will have had too much wear already. To find gems, be prepared to visit a shop weekly and to walk out at least every other time with nothing. Make friends with the staff - we love to chat to people coming in and believe me - ALL sorts of people come into charity shop, so don't be shy. 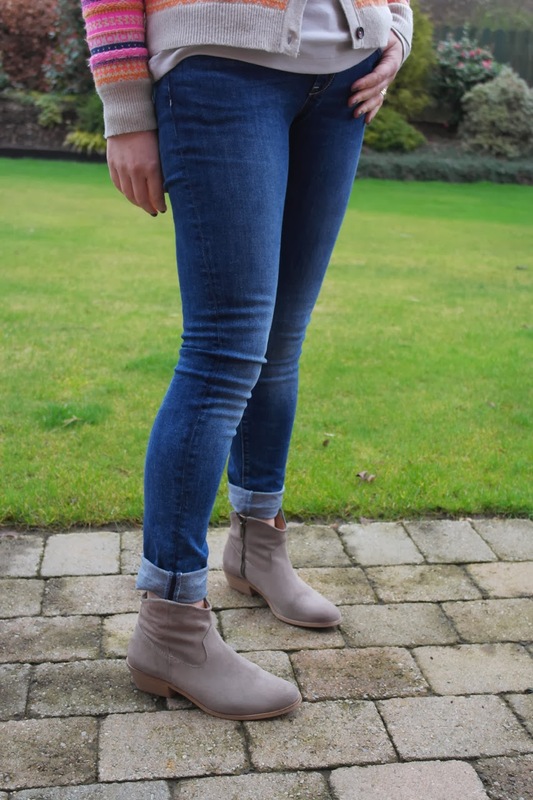 For today's post, Rule 5 applies - I found nothing when searching today for this post but last week was more successful as I found these Autograph at M&S skinny jeans in a size 12 for £4.50. They've had very little wear and fitted me perfectly - they even came to London with me! Here they are worn today with my Boden Fair Isle cardigan (limited sizes in clearance) & Seven Boot Lane Boots. The jeans are a bit long for these ankle boots so I've turned them up but the length will be perfect for pumps. 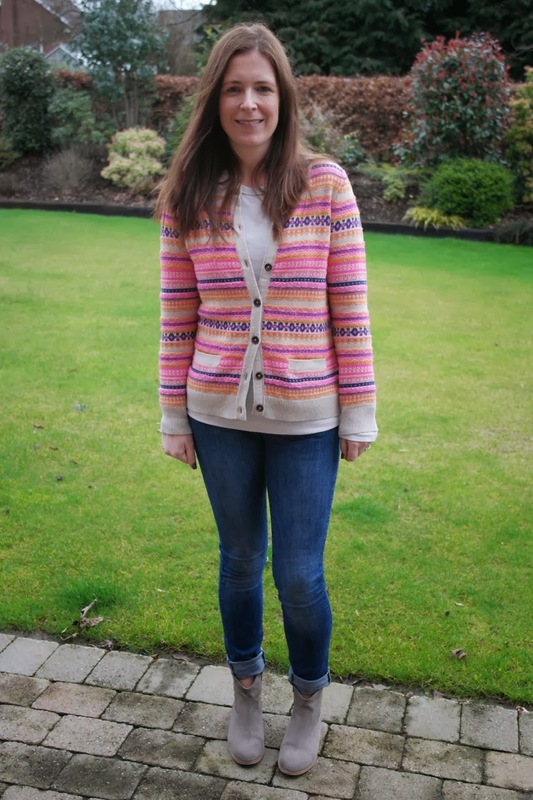 I do love this cardigan - it's such an antidote to the wet weather with the neon pink and orange...I'm wearing it over a simple Gap long-sleeved tee in a putty colour. A great neutral basic to have - they're in store at the moment. 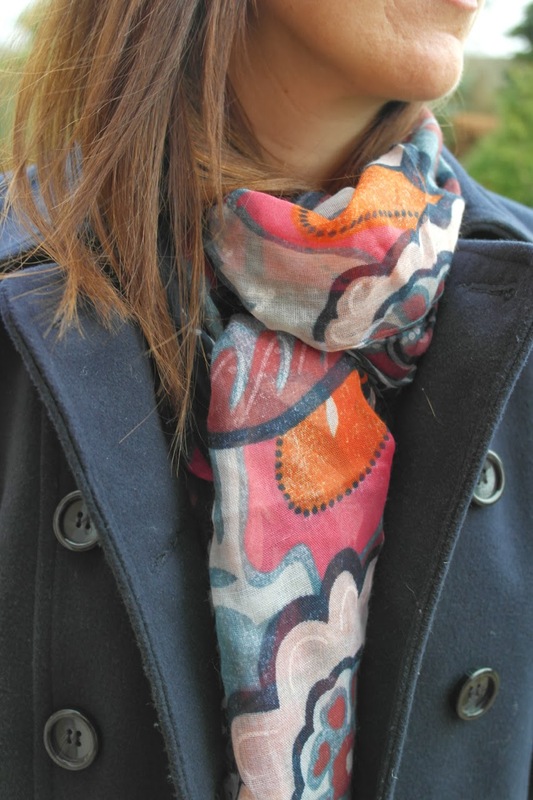 Over all this - for the morning at least, I wore my BHS navy Pea Coat and one of the new scarves that has just arrived in my shop. It was a no brainer 'keep one for me' as I adore the colours in it. A proper dark navy with pinks, orange & blue/greens.. But come 3pm, the suede boots and wool coat were replaced by Sorel boots and my Target Dry Parka as the rain was torrential. I do love an excuse to wear these boots though.. So now it's over to you - have you had an amazing charity shop find? If so, share it in the comments or if you've blogged about it, join the linky below. I've had to change linky providers once again so if you've any problems linking up, just tweet or comment. In any case, I'll be doing a post each week in March so you will get more chances to link up then. you look great, I've just recently started looking in charity shops but I have managed to get some animal print Dune shoes for £3 and a camel coloured Zara coat for £10! I REALLY need to charity shop for budget reasons and plus it's been a while since I last went - might just do that today! Liking this challenge, I will try to join in as much as I can. Those jeans are perfect for you and a real find. You can't beat a bit of colour when the weather is well... pants! Bright colours make you smile and lift you mood I always think. Adore those boots AND that scarf and who can beat Autograph jeans at £4.50! Will be suss ing out that Linky website too, so thanks Honey! Love Charity shops. Go almost weekly and have found some amazing bargains - Miu Miu and Sergio Rossi shoes, Marc Jacobs bag, Sonia Rykiel bag which everyone loves - bargains are there if you look for them. Stunning Avril - what a find! You know I went past so many charity stores while I was there and I wish I had ventured in - I always think I am wasting my time - but Natalie has found 3 Chanel bags with her perseverance!! Just wanted to say thanks for the inspiration and the tips. I did a little bit of charity shop trawling today (and submitted a blog link!) and really enjoyed it. It was something I used to but haven't in a while. I wouldn't have thought of it without you blogging about it! Some excellent advice. Great jeans. I've been in a few charity shops in the past few weeks and am determined to pick up some hidden gems- but alas it's not to be. Although I did get he wee man an unworn JCB t-shirt for £1, so at least someone is happy! Jacket & Pumps at last! The Perfect Sandals from Clarks! Goodbye Frugal February - Hello Charitable March!